It's a staple product in millions of South African households, but there's just one problem with Zam-Buk - getting in to it! A video of a man bemoaning the difficulties of opening the tin has gone viral. He's seen appealing to the Zam-Buk manufacturers to create an a more easily accessible container. Have you ever struggled to get the best sunbed at a resort? 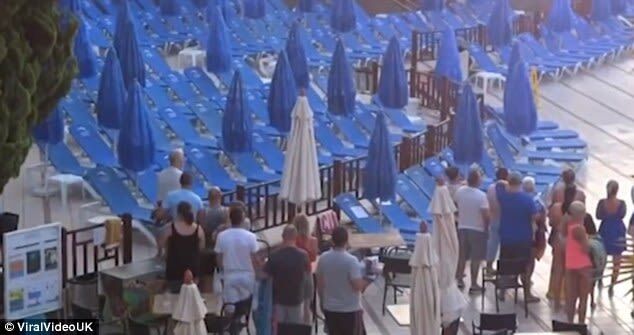 Holidaymakers staying at a Gran Canaria hotel have been filmed queuing up at the crack of dawn before sprinting to secure a sunbed. They started lining up as early as 7am! Social media trend gone wrong. The 'migraine pose' has received backlash from many people saying migraines are nothing to play around with. While the 'Barbie doll' pose has been received and is flooding the timelines in all social media platforms. [WATCH] Toilet paper etiquette, do you tear from the bottom or the top? Grandfather misses a proposal because the phone is in selfie mode and a new way to have someone lie in state. A woman gets annoyed at a kids concert and starts popping their beach balls and what better way to announce you are pregnant? A man in North Carolina asked a black woman resident in the community for ID at a local community pool and the video went viral. And a mom beats her daughter after she caught her recording herself twerking while this dad deals with bullying in a radical way. [WATCH] Why did this neighbour call the police on a 12-year-old mowing a lawn? And would you hide in the ceiling from the police in a store? What's Gone Viral bring you all hilarious and encouraging videos. Khabazela shares tweets, Facebook posts and YouTube clips that are going viral on social media. Check out the videos that have social media users hitting the 'like' button on Thursday's What's Gone Viral. The dramatic moment a teenager walks away from a fatal plane crash and Diego Maradona nearly 'touches the hand of God'. South African Kyle 'Link' Suttie posted a vid of a motorist attempting to overtake a large, slow-moving truck. It didn't end well.